The Congo is not over. Africa is not over. We must reckon with the crimes and injustices of the past. We are obliged to do so as a matter of practicality and of morality. The current tragedy of the Congo is a simple example of a hundred varying forces coming together to make things worse. The root of this suffering is colonialism. The Congo shows the developed world’s claims of caring about human rights, about the rights of the oppressed, are largely window dressing for our more lucrative interest in petro-economies. We focus on the calamities of the Middle East, and spend a sliver of our attention on the Congo, and places like Congo. Our maps don’t even get the size of the continent right. Africa is not so distant from our past or from our lives, but in the theater of the mind, we are always Out of Africa. On a report based on interviews with almost 100 victims, the UN’s Human Rights Office said it believed the DRC government to be complicit in the massacres in the south-western Kasai province. At least 80 mass graves have been identified in the region, the UN said, and investigators believe the abuses in the most recent flare-up of violence could amount to crimes under international law. ... But the UN figure is likely to be a considerable underestimation of the true scale of casualties in the violence, which was sparked last year when a regional leader, who was critical of President Joseph Kabila, was assassinated in a military operation. Kabila’s father, Laurent-Désiré Kabila, spent years fighting against the dictator Mobutu Sese Seko. Kabila took power in 1997, and was assassinated by one of his bodyguards in 2001. LDK’s son Joseph took over for him, and has ruled since. The Democratic Republic of Congo is one of the most populated, most resource-rich—and most exploited—countries in the world. And this all happened in the shadow of the Second Congo War, which LDK had a huge part in causing—which nobody talks about. The war ran from 1998-2003. In 2004, after hostilities ceased, a thousand people died a day from easily-preventable causes. The conflict took 5.4 million lives (famine and disease). It was the second deadliest conflict worldwide since World War II. Why aren’t there History Channel documentaries about it? Was it unworthy of coverage by A&E? Why don’t we hear about it? On Friday, the United Nations reported that rebel militias are exploiting child soldiers in horrific skirmishes in the Democratic Republic of Congo. An estimated 850,000 children have been displaced by the fighting, UNICEF estimates. “Children and women tell us of terrible acts of abuse. Many children have been recruited by armed forces, drugged and caught in the violence,” UNICEF’s regional director for West and Central Africa, Marie-Pierre Poirier, said Monday. The current strife pitting tribal militias against the security forces erupted after police killed a rebellious tribal chieftain, Jean-Prince Mpandi, in a raid on his home in Kasai-Central in August last year. Mpandi was the sixth leader to bear the honorific of Kamwina Npasu, which is used by his armed followers. Some believe that he lives on because he was buried by officials with no respect for the rites accorded men of his stature. 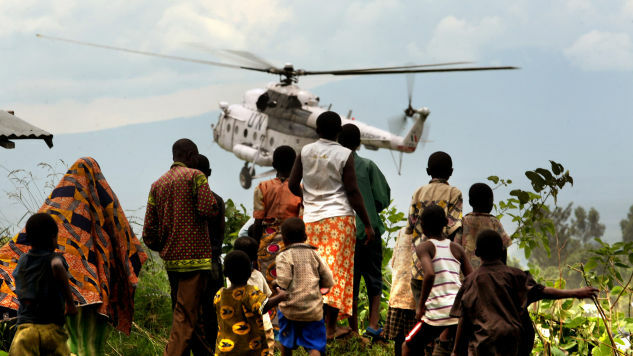 A deep-rooted resentment of President Joseph Kabila’s regime fuelled the conflict, which swiftly spread to other provinces. Kinshasa is accused of appointing its henchmen to powerful posts notably on the deaths of respected chiefs, ignoring their natural heirs and succession rites. We want to commemorate the genocide in Congo because Congo has a history filled with forgotten tragedies. There are no commemorations for the 10 million Congolese killed under Belgium’s King Leopold II’s reign of terror. King Leopold II wiped out half our population at that time – over a century ago – for the sake of rubber, ivory and gold. In other nations, monuments would be built to such a tragedy, books would be written about it and its history would be taught in schools. But in our schools, we were taught that Leopold II was our “Builder King.” We were told of how he helped build our nation by building roads and infrastructure. The man is still sold to Congolese children almost as a “savior” of our nation. To this date, many Congolese at home still refer to him and the other Belgian colonizers as Nokos (maternal uncles). Let me reiterate: The Second Congo War was one of the bloodiest wars of the 20th century—and the 21st. How strange, that it has been so forgotten by the Developed World. Almost as if they had some complicity in the business! And indeed we do. We ignore the cries of Africa now, and we ignored the cries of Africa then. Why? Because we live in a country that loves its history—when it is convenient. We praise the Founders, and forget their slaves. Our talking heads mouth pious words about the Republic. Our pundits squawk about children not learning the past. But where is the history of our crimes? Why are they so silent about the unpleasant parts of our communal story? And why is our history always pictured independent of every other event in the world? Enslaved people built this country. Africa and America are inexorably tied, in every way. Teaching about American history means learning about the history of ethnic cleansing and slavery. Celebrating World War II means remembering how we turned away Jewish refugees and threw the Japanese into internment camps. And talking about Africa’s problems means talking about our problems—the economic system we run, and the political order we inherited from Europe. Otherwise, we cannot deal with the problems of the world. The crimes committed in Africa involve the complicity of the West. The challenges of Africa are the challenges of the world. We all began in Africa, and our cares and our conscience must return there too.